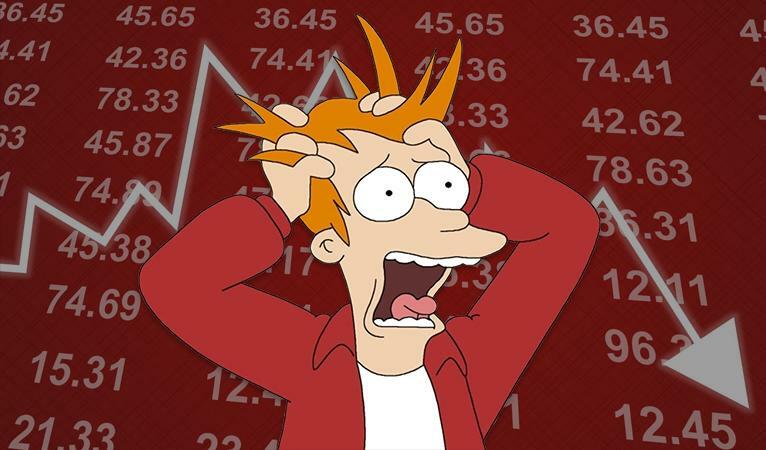 The Market is Crazy – What Should I Do?! Fixed or Variable Rate Mortgage? Just last week, the Bank of Canada decided to hold the interest rate even though it felt like literally, every economist was saying that we should expect a rate hike. 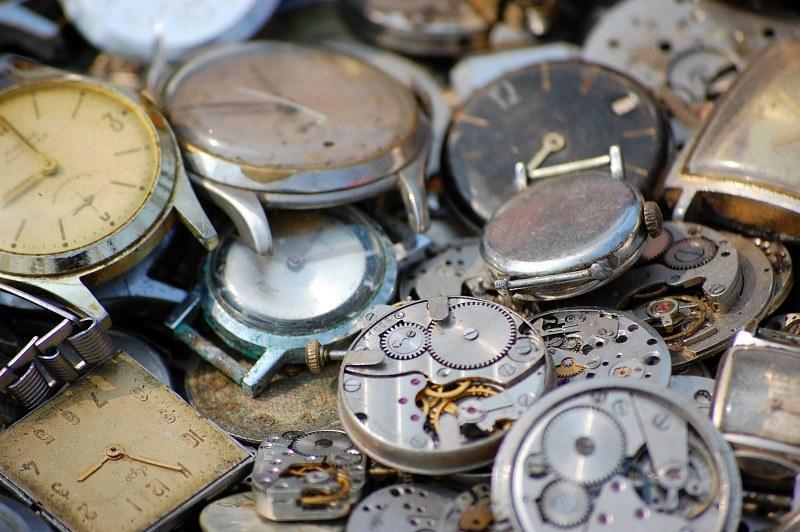 Even a broken a watch is right two times a day. So perhaps the bears of the interest rate market will eventually get it right. Maybe next time (that’s what they always say for the Toronto sports teams, right?). Ultimately, they will get it right because the trajectory of interest rates is trending upwards in the short term, but just not as quickly as people may think (in case of a financial crisis, but that’s an insight for another day). So the ultimate question for investors is this: Should I lock in my mortgage rate with a fixed rate or go variable? First, allow me to to give you a quick summary of how these rates are determined. 1) Variable Rate – The variable rate is determined by the Bank of Canada’s (BoC) overnight rate. The Bank’s mortgage rates fluctuate with the BoC’s overnight rate. The BoC provides a schedule of dates in which they will make announcements related to interest rates and other matters. The 2018 schedule is below. 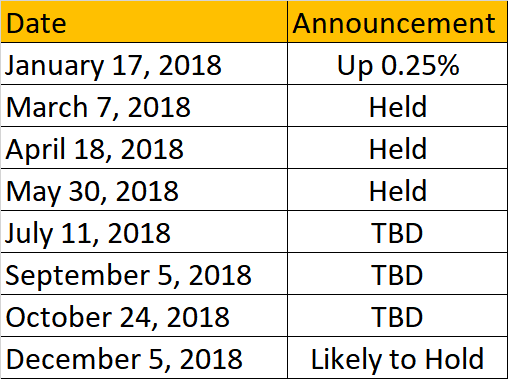 We are just past the halfway mark of the announcement dates listed above, and have had only 1 rate increase of 0.25% (to a total of 1.25%) so far. The BoC initially told everyone that they plan on increasing the interest rate by 1% this year. To date, they are definitely not on track with that plan (thankfully!). With only 4 dates remaining (changes are usually in 0.25% increments) and with December being a hold (historically speaking), I don’t think we’ll get that 1% total increase that they keep on telling everybody. 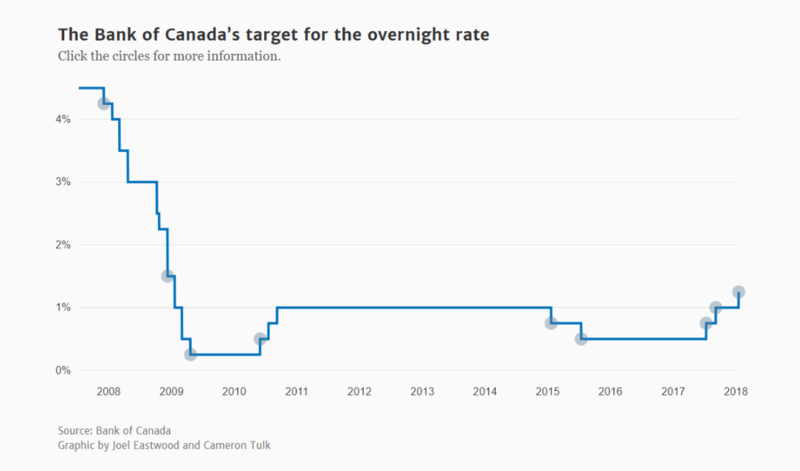 Below is a recent history of the BoC’s overnight rate for a brief trending overview. The rates are still very low, even if we get that 1% increase. 2) Fixed Rate – The fixed rate is determined by the bond market and NOT the BoC’s overnight rate. I’m not going to get too technical on this explanation but the bond market and mortgages are directly related to one another. Below is a recent history of the 5-year fixed rate for a brief trending overview. The Rates – Currently, as it stands, mortgage lenders are pushing really steep discounts for variable rates for many reasons I will not get into in this insight. The lowest 5-year variable rate I’ve seen is 2.16%. So which rate is better? That ultimately depends on you. At the end of the day, real estate investing is about making your life easier and giving you financial options. If you lose sleep because you worry about the variable rate’s performance, then go with the fixed rate and build the fixed rate into your analysis of the investment. 1) The Difference – The current rate difference is 1.25% between the lowest variable rate and the lowest fixed rate. Over the course of 5 years, there is a chance that there could be five 0.25% increases totaling that difference of 1.25%, but there’s not enough likelihood right now that it’ll get there. Even if it does, I’d rather pay below the fixed rate for the years to come until that day happens (if it does). As a side note, every 0.25% rate increase is about an additional $12/month to your monthly mortgage payment per $100,000 that you owe. 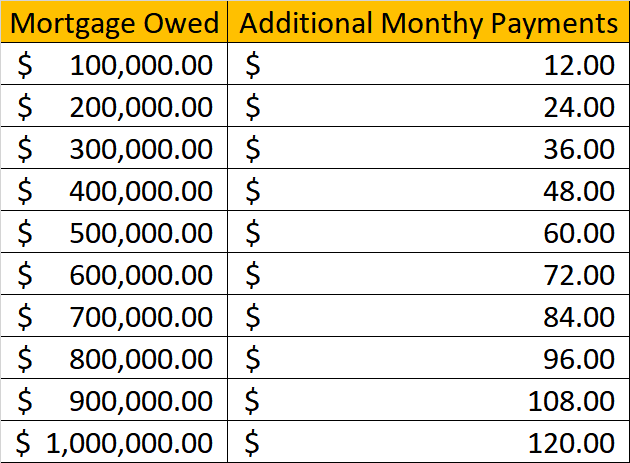 Below is a chart to help you easily see what a 0.25% rate increase will cost per month based on the mortgage amount that you owe. 2) The Fees – Should you ever need to break your mortgage to sell, refinance or put a line of credit on the property (i.e., HELOC) to access the equity for your next purchase, the penalty for breaking a variable rate is only 3 months interest (i.e., approximately $2,000 to $3,000). It is substantially more when breaking a fixed rate mortgage (approximately $10,000 to $15,000). As I typically recommend leveraging existing properties to buy additional properties to grow your real estate portfolio, keeping your options open would be ideal. Hence, the variable rate, in my honest opinion, gets my vote. When should I go fixed? A simple rule of thumb is when the difference between the fixed and variable rates offered to you is only about 0.50% and you don’t plan on picking up another property for 5 years. If that is the case, then you may want to opt for a fixed rate mortgage. The Wrap – I hope that provides you with some clarity on whether you should lock in your mortgage rate or go with a variable rate mortgage. However, we all have different goals and you may be at a different stage of your real estate journey than someone else, so please do not hesitate to contact me for a more customized answer. I can also help connect you to a professional investor-oriented mortgage broker. Let’s start helping you build a winning team behind you every step of the way! Previous Previous post: Generation Millennial – The Next Wave of Buyers or Renters? Next Next post: Real Estate CRASH – What Will Happen To My Rental Property? !